Cabinet ministers have today given the official go-ahead for Heathrow expansion. This was never in doubt, (not an unexpected triumph for Heathrow …) as it is government policy. The NPS (now no longer a draft) was “laid before” Parliament, so now MPs will have to vote on them within 21 Parliamentary sitting days. ie. before Monday 9th July. Simon Dudley, leader of Windsor and Maidenhead borough council, said a coalition of four local authorities and Greenpeace would seek a legal review of the plans for a Heathrow 3rd runway, if MPs vote for the plans, as they are. approve unchanged plans. The councils (Windsor & Maidenhead, Wandsworth, Richmond and Hillingdon – some of the boroughs worst affected by Heathrow noise and other impacts) want the government to “satisfactorily address concerns” over noise and air pollution. Mr Dudley said the councils will look at the proposals to see whether their significant concerns on flight paths, “respite”, night flights and air pollution have been addressed. If they have not, there will be a legal challenge. Greenpeace and the authorities contend new evidence on the severe health impacts of air and noise pollution makes the expansion of Heathrow far less likely to pass a review. This document details the changes between the draft and final NPS published today. As ever the devil is likely to be in the detail, in amongst the 36 different documents and appendices published today…. The proposed Airports National Policy Statement supports a new north-west runway at Heathrow Airport. Today (5 June 2018) ministers have set out final proposals to back Heathrow expansion – moving Britain a significant step closer to more flights, more jobs and greater economic growth. Marking an important milestone in building a global Britain, the government has published the proposed Airports National Policy Statement (NPS), backing Heathrow expansion through developing a new north-west runway. Under the proposal, expansion will be delivered in a cost-efficient and sustainable way, with a comprehensive package of measures to support affected communities and protect the environment. Heathrow will be privately financed and costs will not fall on the taxpayer. To make sure expansion is delivered with consumers’ interests at heart, the government has asked the Civil Aviation Authority to ensure the scheme remains affordable while meeting the needs of passengers. More jobs: Heathrow expansion would create tens of thousands of new local jobs. A new runway at Heathrow would provide benefits of up to £74 billion to passengers and the wider economy and create tens of thousands of local jobs. It will better connect the UK to the rest of world with an extra 16 million long-haul seats available by 2040. Heathrow is already the UK’s biggest airport for passengers and freight and the north-west runway will almost double the airport’s capacity for goods, allowing businesses across the country to increase their exports and take advantage of new global customers. More exports: expansion would almost double freight capacity at Heathrow. The benefits of expanding Heathrow will be felt across the country as there will be more flights around the UK, better connecting Scotland, Northern Ireland, the North and the South West to new global markets via London. Expansion at Heathrow presents a unique opportunity to deliver a multi-billion pound boost to our economy, strengthen our global links and maintain our position as a world leader in aviation. As we leave the EU, the UK must remain one of the world’s best-connected and outward-looking countries and a third runway at Heathrow is the best option to deliver this. We have listened to views through our consultations and will ensure a world-class package of measures to help any local communities affected by the expansion. More UK connections: other UK airports would have more access to Heathrow. The NPS takes into account public and industry feedback and recommendations made by the Transport Committee to ensure that airport expansion in the south-east will be delivered in a way that is cost-efficient, sustainable and in passengers’ best interests. This includes a world-class package of compensation and mitigation measures to support those affected by the expansion, with up to £2.6 billion for compensation, noise insulation and community amenities, which could include improvements to parks and leisure facilities. These are reinforced by plans for a 6.5 hour scheduled night flight ban and noise restrictions which will be legally enforceable. Lower fares: more competition between airlines at Heathrow would help keep ticket prices low. Over the next few weeks Parliament will have the opportunity to debate and vote on the NPS. More choice: Heathrow expansion would open up new destinations for travel. The government has also today committed to supporting all airports beyond Heathrow making best use of their existing runways, including those in the south-east, as long as they address economic and environmental planning issues. A coalition of local authorities will mount a legal fight over Heathrow’s third runway if the government does not alter its plans, says a council leader. Simon Dudley, leader of Windsor and Maidenhead borough council, said four authorities and Greenpeace would seek a review if MPs approve unchanged plans. He said the partnership wants the government to “satisfactorily address concerns” over noise and air pollution. Authorities in Hillingdon, Richmond and Wandsworth are thought to be involved. Cabinet ministers have today given the official go-ahead for Heathrow expansion, with MPs due to vote on the plans “in the coming weeks”. The plans that will see a school and a local trading estate demolished, as well as homes in Longford, Harmondsworth and Sipson. They centre on issues of “respite, night flights and noise”, which he says will affect residents of surrounding areas. “If they have not, whether or not Windsor and Maidenhead Council is involved, there will be a legal challenge”. The government backs expansion, despite opposition from local residents and key political figures like Boris Johnson, because they argue it offers the greatest economic benefits. Greenpeace and the local authorities contend new evidence on the severe health impacts of air and noise pollution makes the expansion of Heathrow far less likely to pass a review. Simon Dudley said he had “significant” concerns about noise and air pollution. Wandsworth, Richmond and Hillingdon councils have previously spent £300,000 from their general funds on legal action. Hillingdon Council’s leader has previously said it would provide funding to challenge it for “however long it takes to win this battle”. “They have failed the environment by supporting a scheme that will not only fail to meet UK air quality targets but also put at risk our climate change obligations. “The very fact the Government chose World Environment Day to announce this scheme really sums up their true attitude to the environment. A parliamentary vote must be held within 21 sitting days; Monday 9 July. The government has finally given the green light to the controversial plan to build a third runway at Heathrow after years of delays and opposition. The transport secretary, Chris Grayling, said the announcement represented a “historic moment” that showed the government had a clear vision to build “a Britain fit for the future”. Critics claim it will damage the environment and could end up costing taxpayers billions. Theresa May and her ministers backed expansion at a cabinet subcommittee meeting on Tuesday morning, with the decision to increase air capacity in London and the south-east then approved by the full cabinet. It will go to a vote in parliament. It’s likely to be another three years before any spades hit the ground. 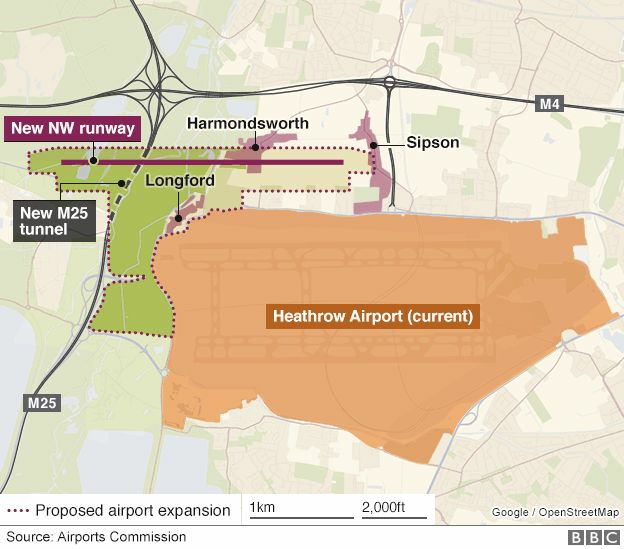 Heathrow’s detailed plans will be subject to public consultation and a planning inquiry. That could all be delayed by judicial review. A separate review of flight paths and airspace is also due. Whitehall officials have said there is no alternative option if MPs block the third runway plan. With the Conservatives divided over the issue, the prime minister will have to rely on the support of Labour and the Scottish National party to win the vote, which will be held within 21 sitting days of parliament, although sources suggested it would take place sooner to prevent any rebellion from gathering momentum. Downing Street is considering allowing MPs with constituency interests to dissent locally, while vocal opponents, such as the foreign secretary and former London mayor, Boris Johnson, and the international trade minister, Greg Hands, could be permitted to miss the vote by being out of the country on official business. Grayling said the decision had not been easy and he recognised the strength of feeling it generated in local communities, “but this is a decision taken in the national interest and based on detailed evidence”. “The time for action is now. Heathrow is already full and the evidence shows the remaining London airports won’t be far behind. Despite being the busiest two runways in the world, Heathrow’s capacity constraints mean it is falling behind its global competitors, impacting the UK’s economy and global trading opportunities,” he told MPs. The transport secretary said the third runway would bring benefits far beyond London, and improving regional connectivity was one of the key reasons for backing the plan. Up to 15% of slots from the runway would be dedicated to improving domestic connections, and the government hoped the increased competition with existing routes would give greater choice to passengers. Grayling confirmed that up to £2.6bn in compensation would be made available for local people, including for noise insulation, and there would be 6.5 hours at night with no flights. The third runway would only be granted planning consent if it met the UK’s air quality commitments, he added. He said Heathrow expansion would be privately funded, although critics claim it could lead to up to £15bn in extra taxpayer-funded transport costs. Grayling said the government was supportive of other airports making the most of their existing runways, although they would have to meet noise and air quality requirements. “I hope MPs will feel the scheme is crucial to our national interests, that we need to work together to deliver it in order to create what I believe is an absolutely vital legacy for the future of our country,” he said. However, Andy McDonald, the shadow transport secretary, said Labour would only back the third runway if the proposal met the party’s four tests on capacity, noise and air quality, climate change, and economic growth. Grayling said the government had acted on 24 out of 25 recommendations from the transport select committee, many to protect local communities. But John Stewart of the expansion opposition group Hacan said the revised policy statement appeared to “make a lot of nods to the committee, but a lack of firm commitments on how these recommendations will be put in place”. He said the third runway would mean “a tsunami of noise” for local communities. Lilian Greenwood, the chairwoman of the transport select committee, said expansion should result in more domestic routes that were fairly distributed across the regions and nations of the UK. Caroline Lucas, the Green party MP, pointed out that the words “climate change” were not spoken by the transport secretary during his statement, questioning his commitment to the environment. The Conservative backbencher Zac Goldsmith, who forced a byelection over the issue, accused the government of writing “a whole book of blank cheques” signed by the public to deliver the project. Unions quickly weighed in to urge MPs to back expansion, with Labour’s support potentially crucial to carry the vote. The GMB union said the case was compelling and would deliver 180,000 jobs nationwide. The statement ruled out a proposed shorter version of the runway that Heathrow had been considering in an attempt to bring the cost down from the airport’s original £17bn estimate. Posted: Tuesday, June 5th, 2018. Filed in General News, News about Airports, Recent News.